Parents will never tell you who their favorite child is. So to promote the new season of the politically incorrect comedy Modern Family on New Zealand’s Prime TV, FCB New Zealand invented a gadget that will. The Favourite Child Detector analyzes parents’ Facebook behavior – including “likes,” tags, comments and photos – to determine which child they favor. To test where you rank with your parents, or to test which child you as a parent prefer on Facebook, visit favouritechilddetector.com. The device can test almost anyone – your friends, colleagues, even your dog. Remember, these are modern families we’re talking about. 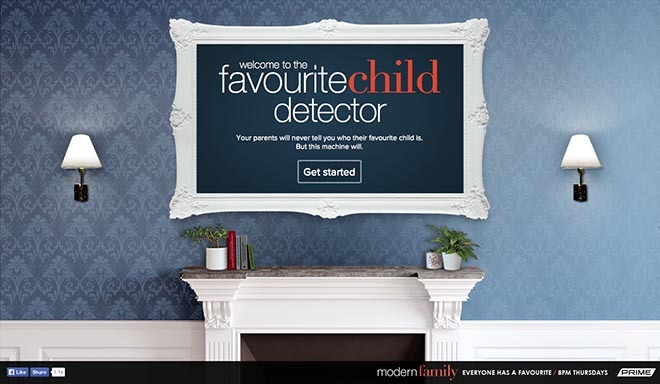 The Favourite Child Detector gadget was developed at FCB New Zealand by executive creative director (Asia Pacific) James Mok, executive creative directors Regan Grafton and Tony Clewett, copywriter Alan Jones, art director Angelo An, senior digital producer Andrew Jackson, digital producer James McMullan, account manager Steph Hueber, head of digital production Hayden Thomsen, group account director Toby Sellers, media manager Roxane Vosper, senior digital media planner/buyer Lucy Leckie, working with Prime TV marketing director Kate Whittle.